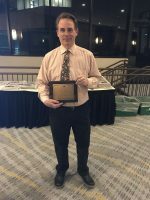 Martin Wilbur, The Examiner’s editor-in-chief, won first-place for best editorials at this past weekend’s New York Press Association 2018 Better Newspaper Contest awards ceremony, held at the Albany Hilton. Examiner Media won honors for its journalism in three critical categories at the New York Press Association’s annual conference this past weekend in Albany, including first-place for editorials. In addition to the award for best editorials by The Examiner’s editor-in-chief, Martin Wilbur, the newspaper group was also recognized in the news and sports categories. The press association awarded second-place for best sports action photo to The Examiner’s sports editor, Andy Jacobs, and gave an honorable mention to former reporter Anna Young in the spot news category. “Really did a nice job informing the public, but also kept the pieces easy to read,” the judges from the Wisconsin Press Association said of the editorials. The three pieces from The Examiner submitted for the best editorials of 2018 prize were headlined “Chappaqua Schools Super’s Attempt at Secrecy Benefits No One,” from the Apr. 24 edition, “Newsprint Tariffs and Fake News Mantra a Threat to Democracy,” from the Aug. 14 edition and “North Castle Owes Public an Explanation Over Goldberg Decision,” from the Sept. 11 edition. 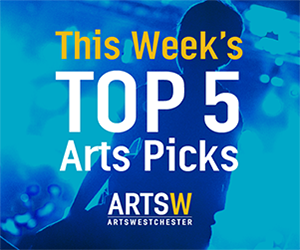 The award-winning action sports photo was for a football picture Jacobs took of a pair of Westlake High School defensive players breaking up a throw intended for an Ardsley pass receiver in the Sept. 18, 2018 edition of The Examiner. “The photographer captured a great moment of action featuring three players,” the judges stated. “Good spot news reporting,” the judges concluded. 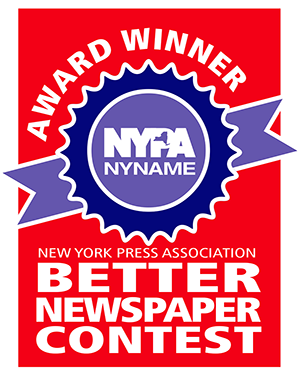 The annual New York Press Association Better Newspaper Contest awards ceremony, this year at the Albany Hilton, is held as part of a two-day industry conference featuring expert speakers and lecturers. The keynote speaker on Apr. 5 was Margaret Sullivan, a prominent Washington Post media columnist and former New York Times public editor. Between the Apr. 5 and Apr. 6 Friday and Saturday seminars, industry leaders conducted more than 60 educational sessions. In all, 163 newspapers from New York State submitted 2,743 entries. Newspapers are divided into multiple divisions so they are competing for awards against publications of comparable circulation. The coveted overall Newspaper of the Year prize was awarded to The Suffolk Times. 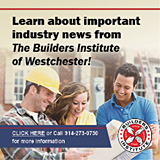 Examiner Media publishes four weekly newspapers, The Examiner, The Northern Westchester Examiner, The White Plains Examiner and The Putnam Examiner, as well as TheExaminerNews.com, a community news website.